Ok, besides me, who else used that quote? Is that open water in the Kenora Channel from the Web Cam? Yes. Also look at the preset for Passage Island. Open to the ice road. Just took my first airboat ride to Young's Bay. Have never seen the ice going so fast. Craziest part is the ice road just west of Butterfield Point. Either broke through, or sagged the ice. My boat is pretty lite. Unheard of for the first trip of the spring. Keep in mind people were driving full sized SUVs on Friday. Was fuelling it about 20 feet off the floating dock, and had a leg poke through. At this rate we might make the opener yet. Amazing what has happened in just two days since my reply. Are you getting nervous about getting the Ranger and Zag in the water? I sat in the Lund this afternoon feeling pretty good about Memorial Day trip. All checked out OK and no problems that I know of. Thanks also for the youtube video. No surprise with a Lund and Yammy. They make the Maytag repairman look busy. Went to Young's Bay today. No way is that ice going to survive two weeks. Would not be surprised to see it gone in a week or so. Degrading by the hour. Zag is ready to rock. I would think Jordan will start putting boats in the marina within a few days. Almost open. Now getting them out will be interesting. Very, very sallow. I still have to pick up the Ranger from the Land of Lincoln. Still at the dealer. Here's a strange one. Looking at the web cam this morning, and following the ice road to the east, you can see two distinct transitions in the ice quality. I have never seen these so well defined before. You can definitely feel these when driving over them. If it's not white, you are ether sagging or breaking through. One would think based on where this is happening, that it would be current related. However, the outflow at the dam remains a paltry 150 cubic meters per second, and there is no real snow melt. Creeks are barely trickling. Don't know how to explain this. View of Young's Bay this morning. Marina ice free, but very shallow right now. Fred the mailman put his boat in, and said ramp was a bit problematic. Open water goes out beyond the weeds. Fairly still ice from there, to the east side of Brush. Then mush from there. Open water pretty much from Mergen's Point to about Centre Island. With some slush ice here and there. Wow, that pics from Young's show how far down it really is. I had to swim under that south dock one year to retrieve Krissie's phone. Now it would have a dock sitting on it. Yes lord, please send some rain. Here’s an update: Looking out the window this morning I can see a couple of acre sized icebergs float by. So things are breaking up. Went to Young’s Bay late yesterday with mixed observations. Pretty much ice free from here to just west of Mergen’s Point. Then mush ice from there to just east of Brush. When I say mush, would hardly hold up a squirrel. From there to YB, ice had somewhat firmed up with the much colder temperature. Kind of a disappointment. Open water out of YB extended out much further, and when getting back on the ice road, had to travel quite a while to stay up on the ice. Lots of open holes along what was the banks of the road. Have not been to the east, but looking at the webcam, looks like the ice starts about Centre Island. Heading that way this morning, so will know more. All we need now is wind, and the desired wind directions. Will be over in a heartbeat. Am I right in thinking you're usually thawed by early to mid April? No. Think it averages about the first few days in May. 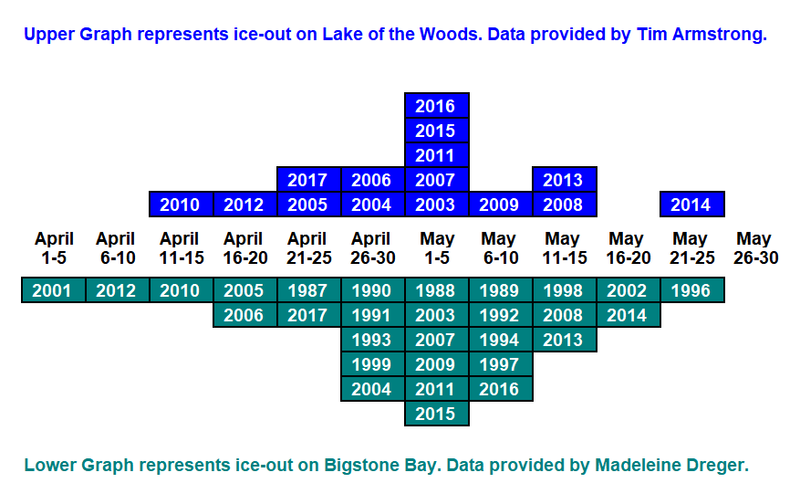 Only thing this year we had more ice than usual, and thinks just were not happening. Now it's somewhat accelerated and may only be a few days later than average. Thanks. I'm on his mailing list. Always fun stuff to read. They are typically a week or two later than us. Back in our boat rental days I was always chomping at the bit to get to Kenora to pick up equipment. Seems like the Manitous were always the problem. Or....Holding a muskie girl style!!! Happy days are here again. Now only if it rains lots over the next 2 weeks.